The Cathedral Choir has existed for almost 500 years and is renowned for being one of the best in the world. Nine centuries ago the boys and monks of the Benedictine Abbey of St Peter, Gloucester, sang for daily worship. 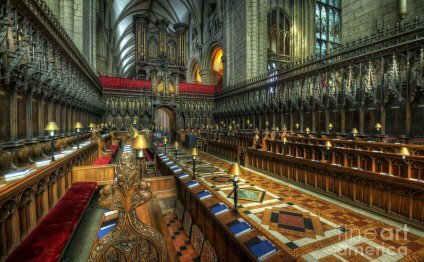 Today’s choir stems from that established by Henry VIII in 1539. The choir consists of 20 boys (choristers) and 12 adults (Lay Clerks and Choral Scholars). The Choristers receive generous scholarships to attend The King’s School, also founded around the same time as the Cathedral by Henry VIII. The Cathedral supports three Choral Scholars and an Organ Scholar to help young people gain experience of the Cathedral music tradition and valuable training prior to them taking up a university place. Adrian Partington, who was himself a Chorister at Worcester Cathedral and Organ Scholar of King’s College Cambridge, was appointed Director of Music in January 2008 with a remit to maintain and develop standards of musical excellence in the worship at the Cathedral. The Assistant Director of Music, Jonathan Hope, accompanies the majority of the Cathedral Services. The choir sings six services each week in term time, major carol services at Advent, Christmas and Epiphany. Once or twice a year the choir sings live on BBC Radio 3, and they regularly take part in concerts with other prestigious choirs and orchestras; the choristers have recently sung in combined concerts with the Bournemouth Symphony Orchestra and the Gloucester and Bristol Choral Societies. A CD of Music for Evensong at Gloucester Cathedral, commemorating the start of the “War to end all wars” on 4th August 1914 was released in November 2014, recorded on the Priory label and available in the Cathedral shop. Prior to that, in 2009, the choir made a commercial CD of the music of John Joubert, much of the repertoire being hitherto unrecorded. In addition, two limited edition CDs were recorded: a CD of the music sung during the 2011 tour to South Africa and a live recording of the choristers singing Britten’s Ceremony of Carols. The Outreach work of the Cathedral choir has included: a 12 day tour to South Africa in 2011, a 5 day trip to the twinned diocese of Västerås in Sweden in 2012, three Junior Voices Project Concerts per year and termly visits to Parishes within the Diocese of Gloucester. The choir are also part of the annual Three Choirs Festival, which is the world’s oldest Music Festival dating back to 1715. The Festival is held in Gloucester, Worcester and Hereford in rotation. In 2015 the festival will be held in Hereford and in 2016 in Gloucester.